I'll admit right here at the front I have a 20-year background as a publications designer, mainly newspapers with some work in magazines and other print periodicals. I loved it. Design was always one of my favorite aspects of the print world. I adored using graphic arts tools to design special covers, making them into a piece of art that still worked for readers without becoming so fancy and artsy as to be unreadable. Mixing type and art is a talent, and I like to think I was at least decent at it. So a few years ago when I became a full-time fiction author, I was thinking I would never again utilize my publications design skills. How wrong I was. For my self-published projects, I have to design the covers for my e-books and books. I also have to format the inside pages of my e-books and books. Sometimes I have to design a back cover. Then, for my fantasy works, I have to come up with maps. To some that might sound like a lot of work. To me, that sounds like fun! Don't get me wrong, because I love writing fiction, traveling to faraway lands and worlds where I get to work with some of the oddest characters imaginable this side of the Mos Eisley cantina. But I also love to sit down at a computer and start from scratch on a design project. Not everyone loves design work, of course, and even those who do love it, or at least tolerate it, can find themselves without ideas from time to time. That's where a website like The Book Designer can come in handy. The site is chock full of helpful articles about book and e-book design, such as "5 Great Fonts for Book Covers" and "How to Check Your Book Proof in 3 Simple Steps." There are sections on the site about Planning Your Book, Making Print Choices, Marketing Your Book and so much more than I can't list it all here. If you have the funds and are the type of writer who wants to hire out your design work, you can even Hire Joel Friedlander, the man in charge of the site and the top dog at Marin Bookworks. For more, check out his Services. You might even want to consider purchasing Joel's book, A Self-Publisher's Companion. Now you writers out there, don't you dare balk at design, because design is very important. Quite often it is quality design that catches a potential reader's eye, or good design that keeps a reader reading. Yes, loads of people say book covers have little to nothing to do with their reading choices, but they're fooling themselves. Think about all the times you did not pick up a book at a store or did not check into an e-book because the cover image was ugly or boring. Think about the times you wanted to set aside reading material because it was difficult to read because of the format or layout. Then realize that good design could have helped. Design alone might not sell your books or e-books, but bad design surely will not help sales. Remember that. Notes: As this a shorter book from perhaps my favorite modern epic fantasy writer, I knew I had to read it. This is a collection of three short novels, all of which happen in the same world as the author's Malazan Books of the Fallen but is not technically part of the series. Mini review: Quite the funny stories here. The author often has humor in his works, but this is the only one of which I'm aware where the entire tales are layered with humor. In many ways, I felt the writing here was stronger than the author's longer works, mainly because he didn't go on for long paragraphs and pages and pages about characters' personal philosophies and the like. Here it was mainly story and dialogue. Though I guess it helped I was already familiar with the main characters. Notes: Call me a sucker, but I thought I'd check out this popular indie author's e-book. To be honest, I don't expect to learn much new, but one never knows. I might pick up a few marketing ideas or somesuch. Mini review: Life changing? No. But I do believe there are some solid ideas here from practical measures one could take to improve sales to more general notions on how to approach one's writing career. Most importantly, this helped to give me a few new ideas of my own, so I'll have to see how they work for me. If you are an older fiction writer, sometimes you might feel like you are being left out, or that you are behind the curve. So many writers nowadays are young, right? Well, not all of them. In fact, more and more people are finding time to write as they approach their retirement years, and many of them have something to say to today's reading audiences. But if you happen to be feeling left out, do yourself a favor and check out the blog titled Fiction After 50. Writers Janet and Ron Benrey are the moderators of the site, and they frequently post about concerns for all writers, but often about concerns specifically for older writers. For instance, they blog about such topics as "A Late-Bloomer Liability," studying whether or writers need to "keep up with the times" in the way they approach their fiction. Another post compares pros and cons of paper books versus e-books, titled "The Persistence of Paper." The Benreys both have plenty of experience in the publishing field, including working as editors and her as an agent, so they are knowledgeable enough of what they are speaking. Of course they also use the site topromote their own e-books, but you don't have to be concerned because for the most part they keep that out of their blog posts. Below is the tentative cover for my upcoming digital novel, Ghosts of the Asylum, planned for a Nov. 21, 2011, release. This cover is not set in stone, but it's the direction I'm wanting at the moment. I might keep it, might make some changes. We'll have to see how I feel about it in a couple of months. There are a lot of writers out there suddenly trying to self publish their own works for e-books. There are also a lot of blogs out there about the very same topic. Unfortunately, most of them are crap, the e-books and the blogs. There are exceptions, however, one such being the blog David Gaughran: Let's Get Digital. As you might guess, David Gaughran is the author of the blog as well as an independent e-book author. And "Let's Get Digital" is not only the partial title of his blog, but also the title to one of his e-books. At it's most basic, Gaughran's blog is a semi-personal one with a focus upon his own experiences and his journey as an indie author. But along the way he provides lots of information and motivation. For instance, he talks about everything that can be of interest to writers concerning the Digital Revolution, from articles on Royalties to thoughts about Short Stories, and considerably more. Beginning writers definitely should be paying attention. And Gaughran goes beyond mere speculation, often becoming detailed, such as explaining about e-book Formatting or providing his own advice about book Covers. He also comments about e-book Pricing and Blogging. If you are interested, you can keep up with David Gaughran through his Newsletter. This is an author worth watching, and his advice seems quite practical, so I suggest paying attention to him. To those who might not know, a query is a letter or e-mail from a writer to an editor, publisher or literary agent in which the writer is asking if the other might be interested in a particular piece of work the writer either has completed or is considering writing. That's the basics. Sometimes query letters are sent to other people than editors, publishers and agents, and sometimes such letters have a slightly different intent behind them. Writers seeking professional publication often face having to write a query letter, and most writers hate it. Why? Well, each writer is different, but many do not feel comfortable begging for another to consider their work, which is kind of what a query letter does. Still, to be a writer, query letters will have to be written and sent off from time to time. Sometimes a lot of query letters. To that end, the website Query Shark can be a writer's best friend. Query Shark is a blog that focuses on how to write query letters. The main way it does this is by receiving query letters for fiction writing from the site's readers, then critiquing those query letters publicly on the site. This can be embarrassing, of course, for the writers of the query letters, but names are not used, and besides, the education provided is important. The critiques of the queries can become quite extensive, so there is a lot here for writers to learn. Not all letters sent to the site are published and critiqued, so don't feel bad if you send something at it doesn't appear online. The author of the site writes that she specifically looks for query letters that bring up problems or situations which have not already been covered on the blog. And speaking of the site's author, who does it happen to be? None other than literary agent Janet Reid, someone to whom it wouldn't hurt to listen. I thought I would do something a little different once more with this series. This time it's an interview with Christine Senter of the site The Prompt Writer. Below are my questions and her answers from an e-mail interview. Your site The Prompt Writer is a place for helping writers come up with ideas. What prompted you to come up with the site? In 2001/2002 I was writing a weekly column for a friend of mine at a site called The E-Writer's Place. The column was called The Write Sites and that's why your list (100 Sites for Fiction Writers) caught my eye so quickly. My friend and I had been discussing writing prompts as she had already created a site with several of her own prompts on it, but she really thought I'd do good with something like that, so I gave it a shot. I started doing a bi-weekly newsletter through Yahoo Groups and in 2004 I bought the domain name. In November we will be 7 years old. I've noticed you use a lot of different styles of prompts at The Prompt Writer, from single words to sentences to "what if" scenarios, even photo images. Do you find the different stimuli help you come up with story ideas? Absolutely! That's how the idea really came into play. I would sit down with a pen and an empty notebook and just write idea after idea after idea. After awhile I realized that I had like 6 notebooks full of writing ideas. That's not to say they were all good, but it helped me to brainstorm. Rather than just shelve those ideas, I decided to pass them along to other writers who might need a nudge in the "write" direction, especially for newbies who were trying to get a start in the writing world. I knew how hard it had been for me, and still is, so I wanted to do my part to help them along. Kind of like others had done for me. How can other writers best use The Prompt Writer site? Check out the "Prompt Ideas" section which can be found in the left sidebar, or the "Pages" section in the right sidebar. The links that have stars in front of them are all from my original site and newsletter. There's hundreds of ideas and it really comes down to what type of genre the individual prefers to write in. I've tried to offer a little something to everyone, but you'll notice I have a soft spot for fiction writers. They totally amaze me. What are some of your goals for the site? Honestly, it's already exceeded all my expectations. I never thought I'd be coming up on the 7th anniversary of the site or that I'd still be doing this almost 10 years later. I've tried to take the blog/site in different directions in the past, but I always end up coming back to doing just good old fashioned writing prompts. I think everyone has a special calling and I think this might be mine. Can you tell us a little about yourself as a writer? What are your goals? Aspirations? Do you have any works available for reading? What about other blogs you'd like to mention? I've been writing for as long as I can remember. I was inventing "friends" as a little kid and even creating whole worlds around them. My mother was very worried about me, but now she thinks I'm a genius. LOL -- I have a deep love of short stories which is why I don't have very many things published. I am working on a novella right now, but it's still a work in progress. Unfortunately, most of the online publications I'd written for in the past have gone under. I've had a couple stories and a few poems published over the past 10 years, and am working toward getting back into the fiction game. I've spent the past 4 years working as a ghost writer for several niche bloggers and that takes up a lot of my writing time. Along with that, I run several of my own blogs, though they don't all get updated as often as I'd like. My personal site, ChristineSenter.com, is a huge mish-mash of ideas and thoughts and oddities that really explain the real me. I'm in the process of trying to keep both sites updated each day throughout the month of August for the NaBloPoMo (National Blog Posting Month) monthly challenge. This month's theme was simply "fiction," and it's really helped me to get back on the right path. I have posted a couple of my stories on my own blog: The Legend, and Life On the Rocks. What are some of your favorite books? Authors? Or do you prefer other areas of writing, such as poetry or screenwriting? One of my favorite books is called The Tuesday Blade by Bob Ottum, and my other favorite is called While The Savage Sleeps written by a relative newcomer to the world of fiction, Andrew E. Kaufman. He was one of the lucky ones as his very first novel made it to #1 on Amazon.com. He's a great author and a very cool guy. I love writing short stories, but my other love is poetry. And as very UNpopular as it is, I love rhyming poetry. I love the rhythm, the meter, the flow. If it's done right, it can take me into an entirely different world. I've written several poems over the years, and have had quite a few of them published both online and in print. I have a few of them on one of my other sites, Priestess Of Words. Outside of writing, I've been married for 21 years and I've got 2 great kids. My son is in the US Navy and my daughter is starting her senior year of high school. I spent 13 years as a Boy Scout leader and I consider myself a child of God, though I don't really subscribe to any one denomination. Christine, thank you for introducing yourself and The Writing Prompt. From what I've seen, yours is an excellent site for fiction writers needing ideas or looking for new ways to brainstorm ideas. Beginning writers will find The Writing Prompt quite useful, but even the pros are likely to find something of interest. Thanks for the interview, and good luck with all your writing dreams! Mark your calendars. November 21, 2011. That's a Monday. That's also the day I plan for my next e-book novel to be released. It will be another epic fantasy novel titled, "Ghosts of the Asylum." It will also feature my Kron Darkbow character and will be a direct sequel to The Kobalos Trilogy. Some of you might be asking, why November 21? Well, it's right before the big holiday shopping season begins, and it still gives me a few months to finish writing, proofing, and hopefully to get back critiques from beta readers and editors. And I still need to do a cover, of which I've got an idea. I'm about 60,000 words into the novel, which is right at halfway as far as the plot is concerned. Another reason I set November 21 is simply because I wanted to give myself a deadline. As this will be an indie published digital novel, truth be told, I didn't have to have a deadline. But I wanted one. I want this book finished so I can get on to the next project (yes, I've got some ideas, one which is weighing heavy on me). I also feel a deadline gives me a push to completion. In this day and age when more and more writers are becoming published or are publishing their own books and e-books, it can seem daunting to find readers. There's so much out there, how can readers possibly wade through everything and notice your book? Stop fretting. Check out the Book Marketing Buzz site and learn a few things. First up, you can check out the Announcements section to learn about interviews, Web chats, products and more than can potentially help you promote your books and e-books. If that's not enough for you, you can always turn to the Articles area for tips on promoting, success stories, and tons of other information. Maybe you would like to learn about Blog Tours? If so, click the link and find out how blog tours can help to promote you as a writer, and how they can help market your books. The link also provides information on current and upcoming blog tours. If you'd like to find out about some good books, don't forget the Book Excerpts and Book Spotlights. Or maybe you just want to cut through all the nitty gritty and get down to studying Book Promotion Tips? Whatever you want to know about marketing and promoting your books and e-books, more than likely you can find out the information on this site. Or, at least, you can be prompted to such information elsewhere online. How can you be sure Book Marketing Buzz knows what it's about? The site is brought to us by the Pump Up Your Book! public relations firm, which specializes in online book publicity tours. Many beginning fiction writers do not know how to get started making writing their career. They can put pen to paper, of course, or sit for hours typing at a keyboard, but learning about publishing is often no easy task. They might work in short stories for a while, or poetry, but usually the final goal is to have a book published, a novel. The world of book publishing can appear daunting, at first. So how does a beginner learn the ropes? Easy. Check out the site How to Publish a Book. This site covers the basics on How to Get Published, but it goes beyond that, also covering how to Self Publish. Here you can also find contact information and links to the major Book Publishers, as well as information on New Literary Agents. You can even make a little money through this site, as Submissions are accepted for interviews with professionals in the book publishing industry. How much money? Does $50 per interview article sound good to you? If you would like to see some of the interviews already published, check out the site's Blog. If you are interested in the background of this site, How to Publish a Book got its start as a group in the Raleigh, North Carolina, area. The group met every so often, focusing upon writing and including interviews and meetings with literary agents, writers, editors, etc. Eventually the group had as many as 300 members and expanded into other, regional groups within the state. Who headed up the expansion and is in charge of the site? Stacey Cochran. If you don't know that name, you will. Not only is he an author himself, but he also teaches writing at North Carolina State University and is the host of an author's interview television program known as The Artist's Craft. Perhaps you would like to start your own writing group with interviews and such. If so, you might want to contact Stacey Cochran for advice. Many writers like to attend conferences. There they can spend time with other writers, get to know people in the business, do a little promoting and just have a good time. It's like a little vacation that's work related without having to do any actual work. For the most part. But how does a writer find out the when and where of writing conferences? In the past, a lot was done by word of mouth. People who knew people talked to some other people and the word got around. Plus there would be a little advertising in magazines or zines. Nowadays we've got the Internet, and searching for a writing conferences has become easy with the website Writers' Conferences & Centers. This site is basically a search engine for writing conferences. Go to the site, make a couple of clicks and blammo! In front of you is a list of conferences broken down by location, dates, genres and more. Better yet, the search can also find writing centers, festivals, retreats and residencies. You can even search such events that have scholarships available. The search engine is a big draw to the Writers Conferences & Centers site, but there are other reasons to check it out. For instance, there is the Discussion Forum, in case you want to hook up with others interested in conferences. The site also has its own Scholarship Competition, if you would like some financial help in attending conferences. There are Memberships available for the site, but those are more for those wanting to list their events than for writers. To read about various conferences and information concerning them, you can also check out some articles. For a writer looking for events in his or her region, or elsewhere, this is one of the best sites available for that search. I didn't think anyone would be interested, but I've now had two people ask me about a timeline concerning the events of my fantasy world, Ursia. I have a working timeline hidden online, but thought I'd go ahead and make much of it public. There are, of course, some things I left out because they would potentially be spoilers. Other items potentially mysterious I've left in because ... well, because they're mysterious. Enjoy. Note: For those who might be confused by my eccentricities: Historically in my world there is a nation known as Ursia which exists on the continent also named Ursia. It gets worse. The nation of Dartague also has a city named Dartague, which is also the name of the race and the language and the culture. Yes, all one word. Dartague. They were not real wide thinkers back in the day, these barbaric folk. Notes: Sometimes when I'm in the middle of reading a very long novel, I also like to read a collection of short stories so as to break things up a little. To that end, I'm glad this anthology was brought to my attention. Not only does it contain stories from a few familiar names, including some friends, but it's also a collection of "Spiritually infused speculative fiction," as the subtitle says, and I find that interesting. So this anthology was brought to my attention at just the right time. Also, isn't that a nice cover? It's titled "Transcendence," and the artist is Lance Red. Mini review: One of the things I truly love about this anthology was the diversity. All of the speculative genres are covered here, from fantasy to science fiction and horror, as well as several sub-genres of fantasy including magical realism. Too, though most of the materials here are short stories, not all are; there are a handful of poems, a short play, as well as some other works a little more difficult to explain. In a collection such as this, there are often at least a few stinkers, but I can honestly say I enjoyed everything I read here, with a handful of favorites. The first story that really popped out at me was "Fragments" by Aaron Polson, a tale of a mother who sacrifices everything for her children. Steve Goble's "The Blood of Thousands" I had read before, but it remained just as strong on second reading and is truly one of the most different vampires tales I've read. The one-act play, "God's Work," by J.J. Steinfeld stands out not only because it is a play, thus a different reading format, but for its way with words and an ending that is surprising though not necessarily a twist ending. "Hit the Button" by S. J. Higbee is one of the most charming tales of the lot, though it deals with a theme that touches us all, how we cope with loss. All of the stories touch upon spiritual aspects, some with broad stripes while others a more narrow focus, but none are too over-the-top or preachy by any means. Those familiar with e-books and similar digital technology will have a pretty good idea of what kind of siteScribd is and how it works. But not exactly. Scribd is a site somewhat like e-book sites in that readers can go to it and read lots of different documents, but the difference is that Scribd doesn't provide e-books one can download to an e-reading device. Instead Scribd utilizes its own iPaper technology, sort of like PDFs, that allows readers to look over documents on a Web browser. The site has grown quite popular over the last several years, especially with writers. How can fiction writers use this site? Well, you can upload your own documents, which means your novels and short stories. You have the option of allowing those documents to be read for free, or you can sell your documents to readers. Again, this is quite similar to the e-book market. If it helps, think of Scribd as an e-book site but the e-books can only be read online. Though it's a little more tricky than even just that. See, Scribd also has plans in the works to allow smart phone users to use the site, which means the users could read documents on their smart phones. Yet again, kind of like e-books. In fact, Scribd just announced its new app for the iPhone. Scribd also allows sharing of documents through Facebook and Twitter, which is a nice touch. As writers are always concerned about finances, one has to ask: Can you get rich selling your products at Scribd? Probably not. But you can use the site for promotions and you probably will make at least a little money. At least your name and your titles will be out there in one more place. Basically, Scribd is one more tool in the marketing and money-making tool boxes for writers. Look at it as a self-publisher's friend, though plenty of major companies and publishers are also using the site. Maybe you should consider checking it out. In 2002 actor Kevin Spacey and some friends came up with the website Trigger Street, which is now known as Trigger Street Labs. Initially this site focused upon screenwriting and short films, but it has expanded over the years to also include short story writing. Rumors over the years that novel writing might eventually also be included in the site have sprang up, but as of right now it has not occurred. But what does Trigger Street Labs do for writers? At its heart, this is a critique site. You sign up, upload one of your works, review the works of others for points, then use those points to get others to review your work. Quite simple. More importantly, especially for screenwriters, Hollywood folks are known to sometimes peruse the stories and screenplay and films at this site. You never know, if some big wig sees something they like, they might look you up. For prose writers, I suggest learning a little more about screenwriting. If you can write a decent screenplay, more than likely you can put together a decent novel or short story. Screenwriting can teach you the basics of building a plot and character, typically using far fewer words than are needed for a novel, which can also help you to learn to write tight. Back to Trigger Street Labs. Other bonuses at this site are the connections and friends one can make through the busy Message Board. Plenty of readers and writers and filmmakers hang out there, so you can have some fun or get down to business. At Trigger Street Labs you can also keep up with Industry News, that industry mainly being Hollywood. If you're seeking critiques as a short story writer, check out Trigger Street Labs. Or if you just want to read some others' stories and screenplays, and watch some short films, you should check out this site. All too often writers forget to think outside of their own language, their own culture and often their own nation. U.S. writers are commonly accused of this, but it happens to writers from other countries as well. Which is a shame. There are a lot of potential markets out there for writers, and an international publishing industry that too often gets overlooked. That's where a site like Publishing Perspectives comes in useful. This online site features plenty of publishing news and opinions from all over the globe. If you want to know what's going on with publishers in Britain, you need to check out Publishing Perspectives. If you need to find out about some hot new novelist from Argentina, more than likely Publishing Perspectives will have something about him or her. What about th the at publishing company in Germany expanding? Check out Publishing Perspectives. This site tends to focus upon Europe and to some extent the U.S., but there are still articles to be found about other parts of the world, such as articles on Arabic Publishing News. Also, Publishing Perspectives keeps up with publishing news daily through its Feature Articles. International markets are covered through the News Blog, and readers themselves are asked about topics and their opinions in the Discussion area. There is also the Resources department that provides helpful articles and lessons for writers. If you don't have time to check out a website every day but want to keep up with the daily publishing news, you can sign up for the Publishing Perspectives daily e-mail newsletter. So, don't forget about those international markets and the potential there for writers. Check out the Publishing Perspectives site if you want your eyes opened to broader horizons. My experimental epic fantasy short novel Bayne's Climb is currently free over at Smashwords. Just head on over there and pick it up. How long will it be free? I don't know. As long as I feel like it. Maybe a week. Maybe a month. Maybe forever. Heck, it might eventually be free over at Amazon . Oh, yeah, I also mentioned a secret. Well, the secret is that there is a Smashwords coupon code for a free copy of my new e-book novella, The Castle of Endless Woe. But I'm not just giving that one away free to anyone who stumbles across the novella. If you would like the code, e-mail me and I'll send it to you. Hopefully you would do a review after reading the novella, but if not, no hard feelings. 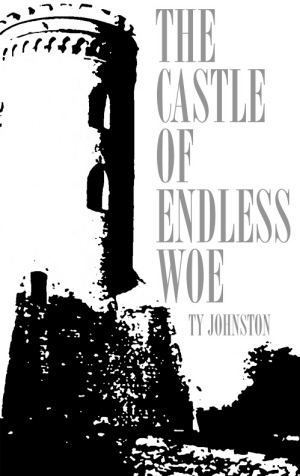 Now available is my new novelette (16,000 words) titled The Castle of Endless Woe. Orphaned by the death of her wizard father, a 12-year-old girl finds herself trapped in servitude and traveling to an abandoned castle in the hinterlands. Among the group assigned to returning life to the castle, she finds her only friend in a barbarian warrior. But then he goes missing, and the castle itself seems to be coming alive in a manner most chill. Who will disappear next, becoming a victim of the castle itself? The Castle of Endless Woe is a young adult, dark fantasy novelette bordering on horror fiction. The tale takes place in the world of Ursia, the lands from my epic fantasy Kobalos trilogy and Sword of Bayne trilogy, though it is not directly tied to those tales. This novelette only costs 99 cents. If you are interested, check out the links below. Just to let everyone know, I'm doing fine. The only reason I've not been blogging much of late is I'm 40,000 words into my next novel, Ghosts of the Asylum. So I'm busy writing that. Yes, it's a Kron Darkbow tale. It's more or less a stand-alone story, though many of the events and much of the plot are outcomes of events that happened in my Kobalos trilogy, especially the City of Rogues novel. 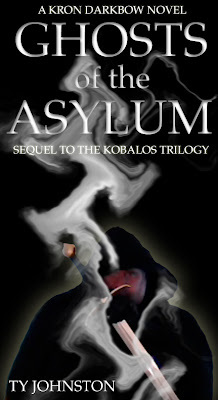 Unlike my Kobalos trilogy, the events of Ghosts of the Asylum do not take place over months, but will all likely occur within a time period of a week or so. Originally I had planned on this new novel being about 80,000 words, but I'm thinking it's going to be longer than that, probably at least 100,000. But in the past I've tended to write long and chop, chop, chop. The difference between then and now, however, is that I believe I'm a tighter writer than I used to be. 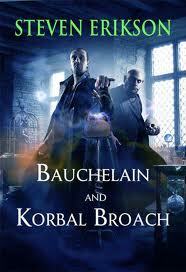 For those who liked my Kobalos trilogy, a handful of familiar names will be returning, but some will not. There will also be plenty of new names showing up. Of the novels from the Kobalos trilogy, Ghosts of the Asylum is most like City of Rogues in that the action takes place within the city of Bond and that the plot revolves around that city's underworld elements. Just to give a hint of the plot: With Belgad the Liar no longer around, someone has to step forward to take control of the city's criminal elements. Then there are the riots in the streets. All the while, Kron Darkbow is busy trying to rebuild the Asylum which was heavily damaged in City of Rogues. Oh yeah, and the Asylum is haunted by the hundred or so souls who died there in City of Rogues. I'll get back to writing now. With this article in the "100 Sites for Fiction Writers" series, I thought I would do a little something different. Instead of me telling you what I think of the site, in this case Scribophile, I thought I'd let Alex Cabal tell you. He's the head honcho over at Scribophile, and here are the results of my e-mail interview with him. For those who don’t know, what exactly is Scribophile? Scribophile is a writing group of tens of thousands of writers who take their writing seriously. It's a place where writers can post their writing and get real, constructive, and lengthy critiques and reviews, and discuss the craft of writing with other dedicated writers. What does Scribophile bring to writers that they can’t find elsewhere? There are lots of critique sites and writer's groups out there on the Internet. The problem is that with many of them, the critiques you get are just pats on the back, or a few sentences about how the "critiquer" liked this or that. In short, useless for serious writers who want to improve. Scribophile is a group that values genuinely constructive and detailed critiques. The average critique given at Scribophile is 374 words long, and we have many professional freelance editors contributing critiques too. If you visit the homepage you'll see a counter showing that right now we have about 93,000 critiques served for 14,000 works, which works out to something like an average of 7 critiques per piece of writing. We also have an extremely active forum discussion environment. Other writers sites have forums that can be slow or even desolate. The Scribophile forums see thousands of people talking about writing and life every day. We also host free writing contests with cash prizes every month. How can Scribophile help writers with their craft and writing career? Writing is a lonely obsession, and it's not something easily mastered. Participating in the community at Scribophile teaches writers how to improve their writing not just through the helpful critiques they receive, but through learning how to deconstruct the writing of others through the critiques they themselves give. There are writers of all levels here -- from beginners to authors that have been published by big houses like Penguin or Random House to freelance editors looking to help out promising beginners. It's an environment independent of the influence of big-name publishers filled with writers who genuinely love to write. The great part is that you don't have to be a great critiquer to join. We're a learning environment, and that includes learning how to critique. We welcome anybody who has an open mind, a curious attitude, and a willingness to improve themselves. Who are some of the people behind Scribophile? Is there a team, or just one or two people? Scribophile is mainly run by me, with the help from a small team of volunteer moderators, and with a small staff of professional writers who post tips, tricks, and advice about writing to our blog. If you need help, I'm the guy who always gets your e-mail and you'll know that there's someone there who'll always respond. I personally respond to every email that comes my way, sometimes within minutes if you catch me at the computer. How did Scribophile get started? Who came up with the idea, and how? Scribophile got started about three and a half years ago. I'm a web developer by trade, so I built the site on my own over the course of a year. Over the years it's evolved greatly, and today it only loosely resembles what was released so long ago. I'm a horrible writer, but I love reading and literature. I wanted Scribophile to be a place that could nurture writers without exploiting them or wasting their time, and allow them to mature into artists who could produce pieces that I and others would love to read. Are there any future plans/changes/updates in the works for Scribophile? If so, can you comment on some of them? As anyone who's been a member for more than a few weeks can tell you, I'm constantly tweaking the site to try to improve the experience. There's a big list of planned updates, and I often implement member requests too. Just recently I released an update to greatly improve our inline critiquing system, which has proven to be one of the most popular ways to write a critique out there. Directly next on my to-do list is letting members save critiques in progress, which is a feature that's been long-requested and is far overdue. Though ostensibly a site for writers, would Scribophile also be a good fit for those who just like to read and review? Absolutely. The site revolves around critiques and reviews, and reviews from interested readers are a great way to provide relevant feedback for writers. Anybody is welcomed to join! It sounds to me as if Scribophile would be a great site for those seeking critiques and reviews of their writing work, especially for beginners who often have a difficult time finding beta readers and the like. Still, it also sounds like old pros could have a good time at Scribophile and could potentially pick up some first readers. Alex, thanks for the interview, and good luck to you and everyone at Scribophile.